Trawling through the thicket of cyberspace, Clunie Read has gathered a matrix of images that she loops together in four complimentary films creating one inter-connected work. These disconnected images are montaged together to suggest a narrative but explicitly carry a random, discordant quality. 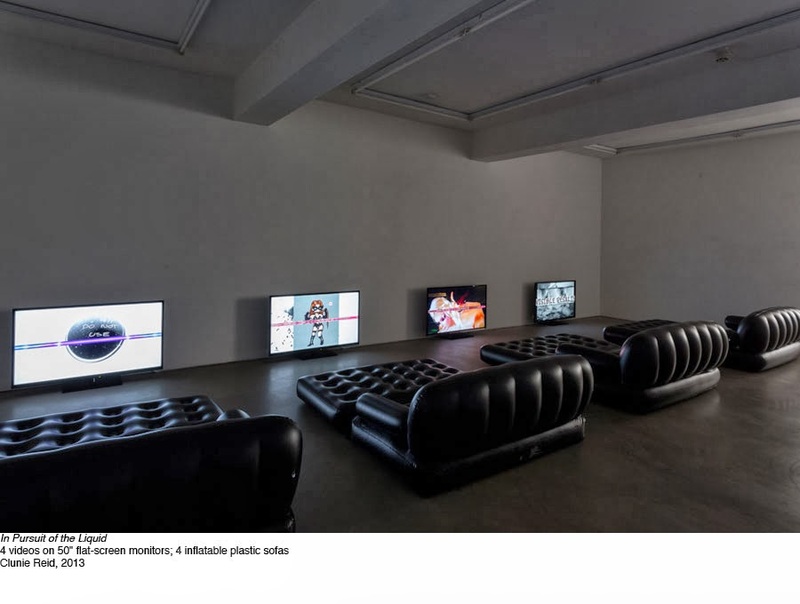 Watching these four films on individual screens placed half a metre above the floor requires climbing onto four rubber air-beds low down on the floor producing both physical imbalance and discomfort. Such furniture alludes to the makeshift world of private, party spaces. Onscreen, animated sequences, including footage from the smallest stop-motion film ever made, are mixed together with avatars and icons taken from surfing and sampling across cyberspace. The flow is erratic and jumpy as material accelerates and then fades away. Exaggerated false breasts collide with jumbled gaming icons, dollar signs, hearts, written instructions and pixelated figures. Clunie unleashes a flood of vulgar sexual and commercial titillation, resembling an online ‘wild west’, a dystopia of frustrated promise, desire and freedom. Blending the innocent with the decadent, Reid explores the collapse of certainties around the invented and the real, between fantasy and fact. This project follows on from her prior use of drawn and collaged material, derived from similar sources. Now she employs film to lend a jittery effect where the images appear locked together in a sequence that both mirrors and disrupts our experience of ‘hyper-reality’. ‘In Pursuit of the Liquid’ has a formal slickness that nicely instils a twitchy anxiety in the viewer. Our hopes and fears within virtual reality are directly addressed. In an age where we find it increasingly difficult to separate experience from the imagination, chaos arises out of technical progress. Cyberspace becomes a place of experimentation and transgression detached from responsibility. We are seduced here into a dysfunctional value system of instantaneous gratification. ‘In Pursuit of the Liquid’ exposes this rather enticing but sordid proxy world to scrutiny, however the films’ raw insistence and repetition tend to diminish the satirical and critical effect. Previous PostJohn Armleder’s ‘Quicksand’ at the Dairy Art CentreNext PostAn Interview with the American artist and photographer, Philip-Lorca diCorcia.